Last Thursday, over 100 participants met at the Arts House in Singapore for the Asia Pacific Writers and Translators (AP Writers) 2014 conference, four days of discussion with the theme Bridging Cultures: creative writing and literary translation. Vanessa Deza Hangad reports. The idea of links across differences prevailed. There were representatives from Singapore and all over Asia, including India, Pakistan, mainland China, Hong Kong, the Philippines, Indonesia, Malaysia, and Thailand. Australia, New Zealand, the US, Canada, Italy and the UK were represented as well. Then there were the global citizens. The hyphenated Asians - Filipino-Australian, Asian-American, Singaporean-Canadian - who lined up for cordials and cakes along with a prominent American translator who had been living in Indonesia for over thirty years and an Australian travel writer based in Thailand. Clearly, the participants themselves were the living embodiment of bridges, people for whom nationality and identity are not always fixed points but figurative places to be traversed by the written word. Topics discussed were similarly diverse, and encouraged a vigorous exchange of ideas. Among Thursday’s roundtable topics were What is Literature, Gender Politics: forcing the issues, and Poetry: art and soul of it. Regional-specific discussions included Indonesian Literature Today and Conversations on Writing Today from Pakistan. On Friday, the roundtable discussions included Changes to the Literary Landscapes and New Publishing Opportunities, How Translation Transforms both the Text and Translator, and The Teaching of Creative Writing in English and the Influence of the Mother Tongue. On Saturday, roundtables included Language and Politics: new dynamics, and Writing for Children. Published authors led the workshops, which were informative and constructive. Freelance writer Damyanti Ghosh, a veteran of many conferences, said she thought AP Writers’ workshops were high-quality and worth the money, adding: “They have a concrete focus. The workshop leaders have a precise brief of what they are supposed to do.” She particularly liked Tim Tomlinson’s Links, Fragments and Continuity and Sally Breen’s Editing Your Manuscript. For myself, I found both the writing exercises from Tim Tomlinson, and also Dr Tony Burch’s Creative Writing Fiction relevant and on-point. At least 15 book were launched, with readings interspersed through all four days. Launches included those for Agnes S. L. Lam’s Becoming Poets: the Asian English experience, Linda Jaivin’s new novel, The Empress Lover, set in Beijing, and Kulpreet Yadav’s novel Catching the Departed. At 2 performance events Singapore OutLoud #1 / #2, emerging writers shared the spotlight with more established ones. Contributing authors S. Mickey Lim, Sarah Salmon and I read from Rojak: stories from the Singapore Writers’ Group. The spirit of reaching out to developing writers was echoed in the Annual General Meeting held on Saturday, where representatives from Australian literary magazine Griffith Review called for submissions for the upcoming issue Twenty Under Forty In the Asian Century. It was a packed agenda. Rousing keynotes were given by Singaporean author Suchen Christine Lim, Filipino-Australian writer Merlinda Bobis, and Australian writer and translator Linda Jaivin. There was an evening literary walk with Singaporean writer Rosemary Lim, and a fundraiser of music and the spoken word organised by Marc Nair, poet and artistic director of Lit Up Singapore. With so much going on, some attendees felt they were in danger of missing key events! As well as Suchen Christine Lim and Marc Nair Singaporean writers were represented by poet Joshua Ip, who moderated one of the Singapore OutLoud events, and Lydia Kwa, who launched a re-published edition by Ethos Books of her novel Pulse. Many emerging writers based in Singapore also attended. Nevertheless, there was a desire for even more local representation and participation. Dipika Mukherjee, whose novel Thunder Demons was long-listed for the Man Asian Literary Prize, felt that this was a young festival with its heart in the right place, but expressed concern that “not more Singaporeans are involved.” She wanted to see a separate panel that featured Singaporean writers. Whilst the conference was taking place, Singapore was rocked by controversy because the National Library Board decided to remove and destroy some children’s books depicting alternative families. Suchen Christine Lim addressed this in her opening keynote. She was like a high priestess with her arms extended, invoking inclusion with: “May you be loved. May you be treasured. May you be visible for the children of Singapore who do not come from traditional families - the one man, one woman and their children model.” Suchen made the powerful point that the model being upheld marginalises all families that don’t fit the definition, such as single-parent and other alternative households. Her words brought light and warmth into the cavernous room of what used to be Singapore’s parliamentary debating chamber. When we all stood up with her, we were in effect building that bridge to celebrate diversity. Vanessa Deza Hangad was born in the Philippines and grew up in California. She is currently living in Singapore, where she is one of the contributing authors for the upcoming book Rojak: stories from the Singapore Writers' Group. Her work has been anthologised in The Very Inside (Sister Vision Press) and in maganda magazine (UC Berkeley) She is now working on her first novel and on a manuscript of poems. The Asian Review of Books, previously available only online, has launched in paperback, through Chameleon Press, Hong Kong. The first print edition carries material from April-June 2014, covering fiction, non-fiction and poetry from Japan to Iraq and most places in-between. Edited by Peter Gordon, and priced at just under US$19 (or equivalents in other markets), it is now available from Paddyfield.com, Barnes & Noble, Amazon.com, Amazon.co.uk, and other booksellers. 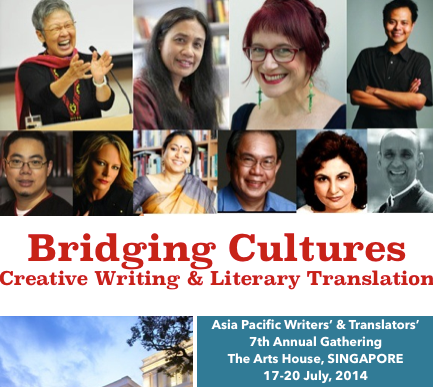 Next week, from from 17-19 July, Singapore is hosting the 2014 conference of the Asia Pacific Writers’ & Translators’ Association (AP Writers). One hundred and fifty writers from around Asia and Australia will be attending Bridging Cultures: Creative Writing and Literary Translation in Asia Today. Jane Camens, acting executive director of AP Writers, has this message for readers of Asian Books Blog. AP Writers began almost 10 years ago with a mission to bring to Asia some of the tremendous resources available to emerging writers in other parts of the world which, at that time, were not available here. Singapore now has or brings in many of the resources that were missing a decade ago. We are honoured that the City-State is hosting our conference this year as part of its efforts to facilitate writers and help grow networks around Asia and beyond. Click here for the Bridging Cultures program, which gives a sense of the fascinating and provocative talks and discussions running from next Thursday to Saturday. Each day starts with a keynote talk by an established author who has gained great respect for her work. Singaporean author Suchen Christine Lim kicks off the event. Her talk, Bridging/Misrepresenting Cultures in Writing & Translation questions the conference’s premise of bridging cultures through writing. We then bring together the other two keynote speakers, Linda Jaivin and Merlinda Bobis, for a free-for-all discussion, What is Literature For? Don’t miss the sessions on what women in Asia write about today and the two sessions on new publishing opportunities. Authors are also invited to use our conferences to launch their latest books. This year in Singapore at least 15 books will be launched into local and world markets. Meanwhile, only one of our workshops still has space, so if you haven’t already registered you might have missed out. This is such a great opportunity to work with international mentors. This year we also gave registered participants the chance of a one-on-one consultation with one of the most successful literary agents in our region, Kelly Falconer. Next year we hope to offer this again, so have your manuscripts in shape by then! AP Writers events are excellent opportunities to make writer friends around our region - perhaps to get yourself invited to speak or read on other platforms! If you can’t join us this year, I hope you’ll try to join us in the years ahead. Next year we’ll be in Manila. The year after…we should know after our annual general meeting on Saturday 20th July. If you are not yet a member of AP Writers you can join at the conference - see me or Ian Smith. Our Singapore conference would not have been possible without the support of the National Book Development Council of Singapore and The Arts House, with support for a number of visiting writers provided by the Australian Council for the Arts, the Cultural Fund of Australia’s Copyright Agency, the Prince Claus Fund of the Netherlands,Yale-NUS, Istituto Italiano di Cultura, Melbourne PEN and Closetful of Books. On behalf of AP Writers, I thank all of them. Susan Barker’s newly-published novel The Incarnations is the book club pick for July – see the previous post for a plot summary. Susan was born in the UK, to a Chinese-Malaysian mother and an English father. As an adult, she moved to Beijing, where she spent several years researching ancient and modern China, before returning to the UK. She then moved back to China, to Shenzhen, and she currently lives in Beijing. Her earlier novels are Sayonara Bar, about a graduate student from England who takes a job at a hostess lounge in Osaka, and The Orientalist and the Ghost, which explores Malaysia’s 1950s Communist insurrection, and its continuing impact down to the 1990s. All Susan’s novels are published by Doubleday. The Incarnations is available in hardback, priced in local currencies. Here Susan answers some questions I put to her by e-mail. What drove your return to China, after you moved back to the UK? Why are you currently based in Beijing? I moved to Shenzhen in June 2012, to stay with my boyfriend who was working for the Chinese tech company Huawei. We lived in the industrial suburbs in the north, where Foxconn and Huawei are. I lived in Shenzhen for about 20 months. My boyfriend quit Huawei this past March, and we moved to Beijing. Shenzhen was really interesting. It is a city of migrants, everyone comes from another province, so I met people from all over China. While you were working on The Incarnations did you ever feel that writing in English distanced you from your characters and subject matter? If so, how and why? I’ve been studying Mandarin since mid-2007 when I first moved to Beijing, but am far from fluent. I don’t feel writing the novel in English distanced me from my characters or subject matter though. Language is a medium of expression, and that which is expressed, i.e. the characters’ thoughts, emotions and behaviour, does not vary much with the language that is used. There are surface cultural and sociological differences between China and the UK that I took into account when writing my characters, but I don’t see these differences as being predicated upon language. Linguistically, my characterisation and dialogue is not very different from many Chinese novels that have been translated into English. Of course, I avoided using overly Western slang and colloquialisms. Is a Chinese translation likely? If so, would you want any input into the translation? I would love for The Incarnations to be translated into Chinese. In the past when my novels have been translated into another language I had minimal or no involvement. I think it is best to let the translator have free reign. What drew you to write about reincarnation? When I started researching and writing The Incarnations in 2007, I knew I wanted to write a novel set in contemporary Beijing, as I was interested in urban China and the speed of development and social change. I was also fascinated by Chinese history, which is rich with narratives of revolution and war and the rise and fall of emperors, and I knew I wanted to write stories from different historical eras and weave them into the modern-day narrative. At the risk of demystifying the novel and writing process, the idea of reincarnation in the novel was initially a narrative device; a way of structuring the novel and bringing together all of my separate research interests in China past and present. But over the years, as I wrote draft after draft of the novel, the reincarnation aspect gained substance and became the essence of the book. The idea of reincarnation and recurring souls also links to one of the major themes of the novel, which is the cyclical nature of history. The taxi driver Wang Jun keeps repeating the same destructive mistakes in each of his past lives, due to innate flaws in his nature (wrath, self-interest, possessiveness, jealousy) that recur life after life. History is repetitious too, with the same large-scale destructive power struggles playing out generation after generation, arising from the same innate human flaws. Do you believe in reincarnation? Do you believe you have had earlier incarnations? If so would you be willing to give details? … Or do you think asking you about your own beliefs about reincarnation is like asking a crime novelist if they’d ever commit murder? I am not sure whether or not I believe in reincarnation. Perhaps I do in my more irrational moments, but it’s a vast leap of faith to believe you’ve had past lives. My sister once met a medium when we were teenagers, who said that she (my sister) and I have been linked together for several past lives, but obviously I am sceptical. Was it daunting writing about 1000 years of Chinese history? Did you ever feel overwhelmed by history? The Incarnations has five historical stories (ostensibly the five past incarnations of the main character, the taxi driver Wang Jun). The first story is set during the Tang Dynasty, the second story is set during the invasion of Genghis Khan, the third is about imperial concubines during the Ming dynasty, the fourth is set during the Opium War, and the last story is about Red Guards during the Cultural Revolution. When I started writing the novel in 2007, I knew I wanted to include historical stories, but I wasn’t sure which eras I would write about. So I read books that gave a broad overview of Chinese history from the Qin dynasty to Chairman Mao, and when I came across a historical period or figure who was especially interesting to me, I would deepen my research in that area (i.e., find every book I could on the subject). As I read and made notes, ideas for plot and characters would surface from my research, and I would proceed from there. I was slightly daunted by the amount of research I had to do for each historical story, but at the same time, I like being challenged and immersed in a long project. I had no idea that The Incarnations would take six years to write though – I thought it would be three years at the most. I definitely would’ve been overwhelmed if had I known back in 2007 how long it would take to write this book. Were you worried about the historical accuracy of your novel, or not? As well as Chinese history the stories are influenced by Chinese folklore and superstitions, and as a result are quite surreal and fantastical in places. As a fiction writer I don’t feel constrained by historical fact in the same way a historian would be. I was able to take inspiration from historical incidents like the Mongol invasions or the Opium War and build on them creatively. The stories do deviate from historical fact, but this did not concern me. Why should readers read The Incarnations? I hope that the sections in contemporary Beijing offer a snapshot of urban China, and that the historical sections offer a glimpse of each era (though, as stated above, The Incarnations is nothing like a history book). I really believe that the reader should be entertained, and wrote the plot(s) with that in mind, and was inventive with my use of language. Characterisation is really important to me too, and I worked hard to make sure my characters are multi-faceted, and psychologically and morally complex. Asian Books Blog does not carry reviews. The book club is generally intended as a platform where readers can offer comments on the month’s selected book. June’s pick was Song for an Approaching Storm, by Peter Fröberg Idling, translated from Swedish by Peter Graves. This post assumes you’ve read it. If you want a summary see here. Given that the approaching storm referred to in the title is the genocide inflicted by the Khmer Rouge on their fellow Khmer, that one of the characters is (the man who became) Pol Pot, and that this whole novel - called a fantasy on the title page (why?) - emphasises the importance of memory, I decided to ditch the usual book club format this month, and instead to ask Youk Chang, Director, Documentation Center of Cambodia (DC-Cam), a Phnom Penh-based organisation which supports the quest for memory, what he thought not of the so-called fantasy itself, but of some general issues it raises. Youk Chang has not (yet) read Song for an Approaching Storm, but he is aware of Peter Fröberg Idling's previous non-fiction work, Pol Pot's Smile, published in Swedish, although you can read an extract in English here. I have given Youk Chang’s unedited answers to my questions. He asked me to mention that he thinks Song for an Approaching Storm is a great title, as do I. How do you feel about treating Cambodia's past as material for fiction? It makes Cambodia more healthy – we are just like everybody else who want to compete for success in the world while memory of the Khmer Rouge remains un-erasable by any means. Do you think Cambodia’s past is better dealt with by non-fiction? It is always better when you have more than one choices to tell the story about genocide since it is almost impossible to describe genocide in words. How do you feel about Pol Pot being treated as a character in a novel? Because it is a novel. How do you feel about a Westerner writing a novel about Pol Pot? Genocide is a crime against humanity and it is everyone responsibility to prevent it. Genocide does not discriminate, why should we? Do you think it would be better for Cambodians to write such novels themselves, in Khmer? The Khmer should write it themselves. The Khmer also should write it too because it makes them healthy and less of a victim as they use the imagination. But Westerners can do it too. It is about humanity. It is indeed, and if you haven’t actually read Song for an Approaching Storm, then I urge you do so. I asked Youk Chang for recommendations of other novels about Cambodia’s recent past, and he suggested Four Faces of Truth, an historical novel by former CIA officer Harriette Rinaldi, published by Fireship Press. July’s pick is The Incarnations by Susan Barker. Beijing, 2008. Taxi driver Wang Jun spends his days driving his cab through the polluted, traffic-congested streets, earning money to support his family. Then one day Wang’s quiet life is disturbed by an anonymous letter. The letter-writer claims to be his soulmate, and to have known Wang throughout a cycle of lives spanning over a thousand years. Other letters follow recounting Wang’s previous lives: during the Tang dynasty; during the invasion of Genghis Khan; as a Ming dynasty concubine; as an English merchant during the Opium War; as a teenage Red Guard during the Cultural Revolution. The letter writer admits to stalking Wang and his family in the present – to watching Wang’s eight year old daughter playing in her school yard and riding as a passenger in Wang’s cab. Wang goes to the police, who tell him there is nothing they can do. His confusion is further exacerbated by the re-appearance of his ex-lover, Zeng Yan, who he begins to suspect of being the author of the letters. The Incarnations is published by Doubleday in hardback, priced in local currencies. Both Song for an Approaching Storm and The Incarnations are eligible for the ABB Book of the Lunar Year in the Year of the Horse. See the post of Jan 30 2014 for details. If you would like to vote for either title please do so by posting a comment, or contacting asianbooksblog@gmail.com. There is a constant stream of great books about Asia coming out. Each month I highlight a couple of new titles that look particularly interesting, from Asian and non-Asian publishers. Singapore on the Couch: Interviews with astonishing individuals by Ong Yong Lock, published by Monsoon Books (Singapore), available in paperback, in Singapore SG$18.50 before GST, elsewhere priced in local currencies. Next year Singapore celebrates its 50th anniversary as a sovereign and independent country, in anticipation Singapore on the Couch asks: what does it mean to be a Singaporean? What, if anything, is normal on the self-styled little red dot? The author is a retired psychiatrist, and thus he is well placed to offer insight into the Singaporean psyche. He does so through a collection of interviews with 12 people, each of whom has achieved prominence in his or her field. Representing brawn are Ray and Roy Yeo, competitive bodybuilders and twins; displaying Singapore’s celebrated business acumen are Richard Eu, of Eu Yan Sang, the famous suppliers of traditional Chinese medicine, and global entrepreneur Vikram Chand; championing the Singapore arts scene are theatre and film producer Glen Goei, and music director of the Singapore National Youth Orchestra, Darrell Ang; discussing faith and its place in multi-ethnic Singapore are pastor Dr Paul Choo and the medical director of one of the country’s hospice care groups, Dr Akhilesh; dispelling the myth of the humourless Singaporean are comedians Toh Paik Choo, Dream Academy’s Selena Tan and the blogger, Mr Brown. Meanwhile, in a class of his own is Professor Tommy Koh, Singapore’s ebullient ambassador-at-large. 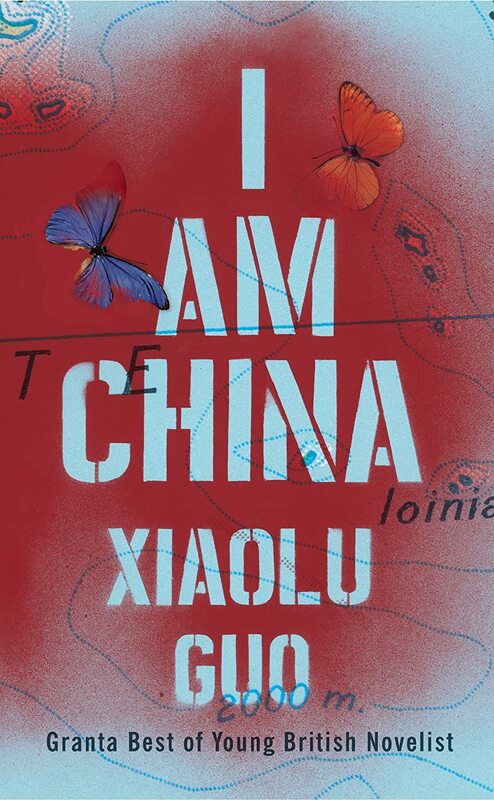 I am China by Xiaolu Guo, published by Chatto & Windus, in hardback and eBook, priced in local currencies. In a detention centre in Dover exiled Chinese musician Jian is awaiting an unknown fate. In Beijing his girlfriend Mu sends desperate letters to London to track him down, her last memory of them together a roaring rock concert and Jian the king on stage. Until the state police stormed in. As Iona unravels the story of these Chinese lovers from their first flirtations at Beijing University to Jian’s march in the Jasmine Revolution, Jian and Mu seem to be travelling further and further away from each other while Iona feels more and more alive. Intoxicated by their romance, Iona sets out to bring them back together, but time seems to be running out. Xiaolu Guo was born in China and now lives in London. She is the author of Village of Stone; A Concise Chinese-English Dictionary for Lovers, which has been translated into twenty-four languages; 20 Fragments of a Ravenous Youth; UFO in her Eyes, recently made into an award-winning film by Xiaolu herself, and a collection of short stories, Lovers in the Age of Indifference. Xiaolu Guo is a successful filmmaker of feature films and documentaries; her work has been seen all over the world. The next book club post will appear on August 3. If you want to comment on The Incarnations please do so before then.